Each year I teach digital media and that includes the creation of all kinds of digital media by my students ranging from photos to videos, websites and multi-touch books. My one group have four subjects including Work Experience. This is a subject I never chose to teach but one I found myself taking on a few years ago. Because it was new to me and I got it half way through the year I have to admit it I winged it that first year. Second time the students all got work experience and then last year they also got work placements. The work placements while fulfilling the criteria of the module didn’t give them digital media experience. They would often find themselves in non-profits or stacking shelves in shops. Both valuable experiences but not opportunities to put their class learning into practice. Fast forward to this year I had a very different group. A group who longed for a little more and who really wanted ‘real world’ experience in the area of digital media. While finding work experience for 1 or 2 would have been possible finding similar experience for the whole class was proving to be quite the challenge and so we came up with the idea to simulate a real work placement experience whereby they create and publish their own monthly newsletter. In the 11 class weeks before Christmas the students learned all the skills they would end up putting into practice and just three weeks ago started their 10 week placements. These placements are just for 60 hours (1 day per week) and after a few ‘staff’ meetings they each found their roles from editor or as they like to call him ‘boss man’ to photographer, videographer and social media co-ordinators. As a teacher I was cautiously optimistic about their enthusiasm but when the time came felt confident enough to cut the strings and let them work unsupervised. After the first day they came to me with a draft asking for my ‘expert’ advice. After the third day they were true to their word and sent me their completed newsletter to proof read later that day. 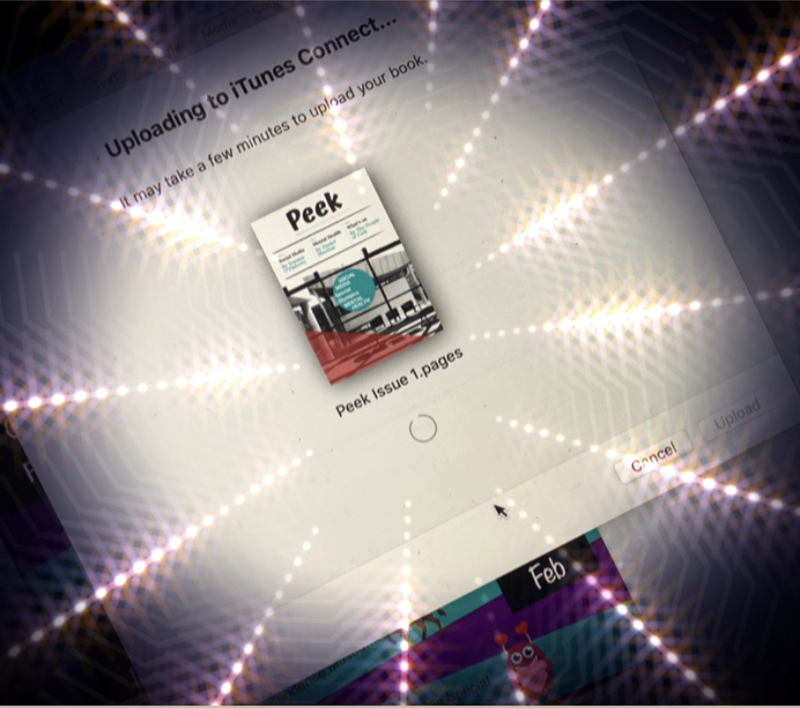 The next day we uploaded the proof read (with a few minor typos corrected) newsletter to the Apple Books Store and they celebrated it’s official release a couple of days later. As I have shown the newsletter to other teachers I have been asked what my input was, what template did they use, how much of it did I do and I can proudly say that it is a 100% student created publication. Over the next couple of months more issues will be released and I am sure their creativity and confidence will grow. While Peek has proven a valuable experience for my students it has also taught me that work experience doesn’t just have to be one of those ‘tick the box’ modules and can be creative. Managed Apple IDs were announced over a year ago and I never really had a need or want for them. I had been using my own Apple ID for close to 10 years so you can just imagine the history of purchases and downloads associated with it. Below is a quick overview of how you can make Managed IDs work for you. I would suggest that when transferring iCloud content you either download to the new Managed ID or Airdrop across. It is a time consuming process but works well. Schoolwork a new Apple app for teachers was launched this week and is everything we have been waiting for. It is a way of handing out assessments and receiving and marking students work. This release came too late for my current classes but I look forward to using it in September. To enable School work staff and student iPads need to use Managed Apple IDs and be set up using Apple School Manager. Because I already had this all set up it was a pretty easy migration to Schoolwork. Clips is a free video-creation Apple app for iOS that devices that was launched early in 2017. Since it’s launch I have been using it both personally and in the classroom. Going back a couple of years the video creation section of my digital media module used to take weeks or learning and content gathering. Often times it was not possible for students to capture their own content so they would use some royalty free video videos and a bit of imagination. Now with Clips I can take students on a trip and they can capture as they go. Some students like to capture everything within Clips which means that they are pretty much finished their videos by the time they return others like to capture their content in the camera roll, make some edits and then import into Clips. My personal preference is the latter method but whatever works for the students. Here are a few Clips that were created after a recent field trip to Elizabeth Fort. I first heard about Assemblr at BETT 2018. Having used both AR and Octagon apps in the past I was keen to give it a try. Assemblr is a free app that allows students to build virtual worlds in a Minecraft like setting and then view them in a real-life setting using AR or VR. Students enjoyed creating the worlds. In terms of education, I don’t think the app is quite there yet for standard classroom use. The big drawback is the fact that Assemblr has introduced in-app purchases for a lot of their characters and items. While students can obviously still build their worlds without these purchases they can still see them and this can and has led to some frustrations. You can see some of my classroom AR Assemblr worlds created by students in the video below. Assemlbr definitely has potential to be an engaging learning app if the developers consider an education version. This activity will demonstrate how you can use loops, functions, colours and sound to code a weather forecast. Each weather type is a separate function an example of which can be seen below. The Learning Games project was an ERASMUS funded project which examined the use of gamification in education. The focus was to develop an App that would allow for gamification in all classrooms from secondary to university level. The project had partners from Spain, Germany, Ireland, Hungary and Turkey. I was lucky to be part of this project and to attend some of the planning meetings. Our college was responsible for the website design which I helped develop while in Hungary and I also gave a presentation on gamification to the partner schools and students. The final application is both teacher and student based which each playing a significant role in the testing and development of the app. Involving students meant that the app would be developed according to their needs and would hopefully be more engaging for them to use as a result. BETA versions of the App were released in June 2017 with a public releasing following in October. 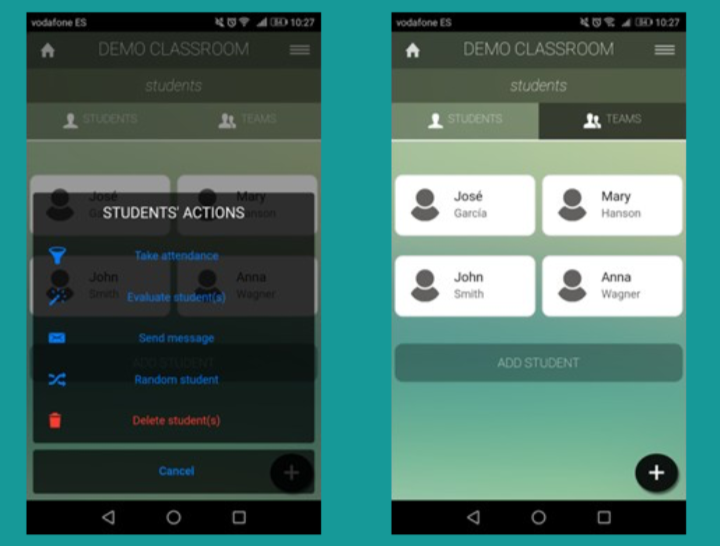 The software application, called “Classquest” was successfully completed and is now available free of charge on both google play and the apple store. The application was nominated in the top ten gamification software products in this years European Gamification Awards and the regional Educational administration in Asturias Spain have indicated that they would like to further develop the application into the future. I first learnt about Swift in 2014 and having had some initial exposure to it, it seemed like an easier version of other programming languages I had already used. Back then it was very early days and not really in the hands of the non-developer so I forgot about it for a while until it suddenly resurfaced at WWDC 2016. WWDC 2016 was really the start of something new and exciting. The launch of Swift Playgrounds meant that Swift was now in the hands of everyone from 10-year-old Yuma Soerianto to 81-year-old Masako Wakamiya who both went on to release apps within the year. Swift Playgrounds truly meant that Everyone Can Code and I enjoyed running playground workshops throughout the 2016/2017 school year. Working in Further Education though there was always that thought in the back of my mind that I would have to move beyond playgrounds and into the scary stuff. The scary stuff meaning the ‘real’ code as some would see it as several including colleagues just didn’t believe that it could really be that easy and didn’t believe that my students could code. Luckily for me Apple expanded their selection of resources to accompany Swift and Playgrounds and the latest additions in April meant that these resources were finally relevant in FE and I could move outside the safety zone of playgrounds (even though I really wanted to stay there!). There was still that fear though of what if after all this I really didn’t know how to do it. However, a workshop in June gave me hands on experience and since then there’s been no stopping me. Initially, I found Xcode to be a little daunting but the interface once I navigated around it was really intuitive and the resources were easy to follow. Going through the resources lesson by lesson I was able to follow the progress and write my own code. 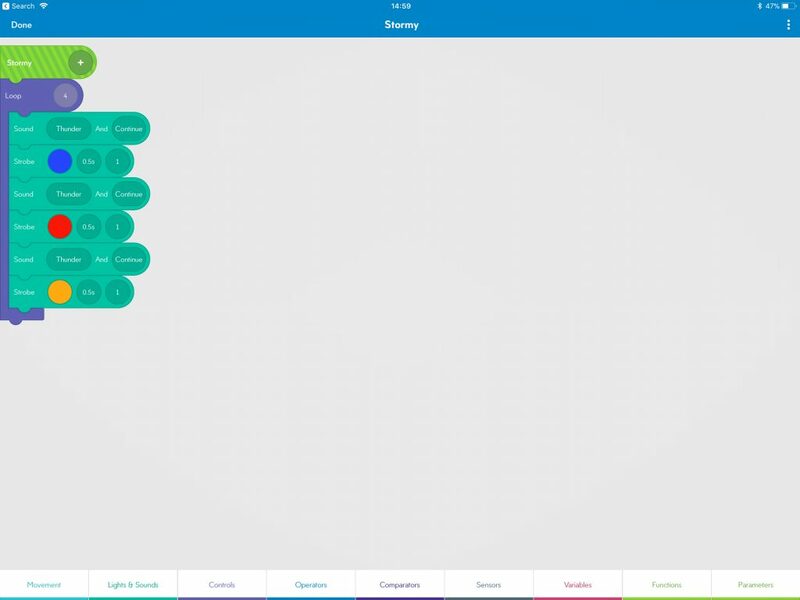 I may not have my own App yet but watch this space…..
Hands-on with Happy by Tuniversity. Tuniversity recently released their iBook featuring Pharrel Williams song Happy. This iBook guides readers through the processes of composing Happy in Garageband. Having never used or even heard of Tuniversity before I wasn’t sure how good this resource would be but for €5.99 I figured it would be worth the try. The 79 pages of the book bring you through the composing process. What I really liked about this is the book doesn’t just immediately jump into the how but also explains the why. By figuring out why you might like to compose a song like this will open up readers and students minds to composing their own songs at a later stage. Another feature that I really like is that the Garageband files and not only this but you get the Live Loops file and also the tracks so whether you use tracks or live loops or both you can find your own way to follow these lessons. While being released at the end of the school year meant limited time to try this out I did manage to squeeze it into one class before finishing up and the reaction was great. Quite often when using Garageband in class there can be difficulty connecting with students who just want to be able to see what the finished project looks like and don’t want to go through the steps of composing all the tracks. Well, these files are perfect for this and also a song that students will know. Students can then take these tracks and break down the composition and in a way reverse-engineer their own tracks. Packed with videos and interactivity the book is one where the 79 pages fly by and before you know it you have your track. The structure of the lessons are clear and engaging and definitely fun. I am looking forward to seeing what else Tuniversity come up with and hope that their collection grows in the very near future. Released over Easter break Apple Clips was just a week too late to integrate into my full-time classes but just in time to integrate into my summer class and because the summer class was just 10 weeks long I figured I would integrate Clips as much as I could. So for anyone that had never heard of it Clips is a simple video making app launched by Apple. While I use the word simple there that shouldn’t be misinterpreted for basic because it is beyond basic. Putting this into perspective in the past this 10-week course used to feature the likes of Final Cut or apps like Animoto…well with Clips we didn’t need either this year. Using a combination of simple effects, photos, videos, text and music videos take just minutes to create. The fact that they can be created so fast means more time could be spent gathering the pictures and videos. Throughout the course students had to create a Clips video featuring the college exhibition and also a Clip featuring the city. While these were literally just the basic Clips I required I found the classes creativity surpassed this and I got to see it used to create stories and fun animations. Take a look at some of their examples below. A quick animation by Nathan using a water bottle and emojis. Short story animation by Nathan.